This session is an excellent way to get your intermediate+ players to work on their agility whilst responding quickly to colour stimulus. With only basic equipment being needed this session can be set up easily anywhere. 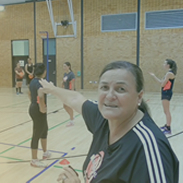 The session requires a good level of understanding from the players, so it's important to take the time to explain it clearly, before starting. 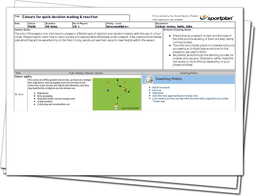 This plan uses 4 drills to improve players' reactions and decision making; progressing in difficulty. Players will learn to execute skills effectively under pressure with decision making challenges that exceed those they will face in a game situation. Beginning the session, players will respond to a call of blue or red to know which colour cone to dodge around, focusing on leg and arm movement techniques to improve agility. They can then use these skills under pressure in a 1 vs 1 drill, with each blue or red defender active as the drill begins by their colour ball being used. This is further built upon in a 2 vs 2 drill which you can tailor to the ability of your players, by giving them more or less time to react to the colour ball. To finish the session, players will play against each other under touch constraints based on colour bib, which can be further progressed to an offloading game. Using this drill players will be able to think and move fast on their feet!